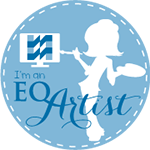 As quilters we strive to use the best materials, tools and products so our quilts will be beautiful and stand the test of time. Sometimes though, a product which might appear to be high-quality might not be at all. Recently, I found this out the hard way. I assumed since this was a highly recognizable, name-brand product it must be high-quality and would produce quality results so I skipped the step of testing the product first. I did, however, read and follow the instructions carefully. 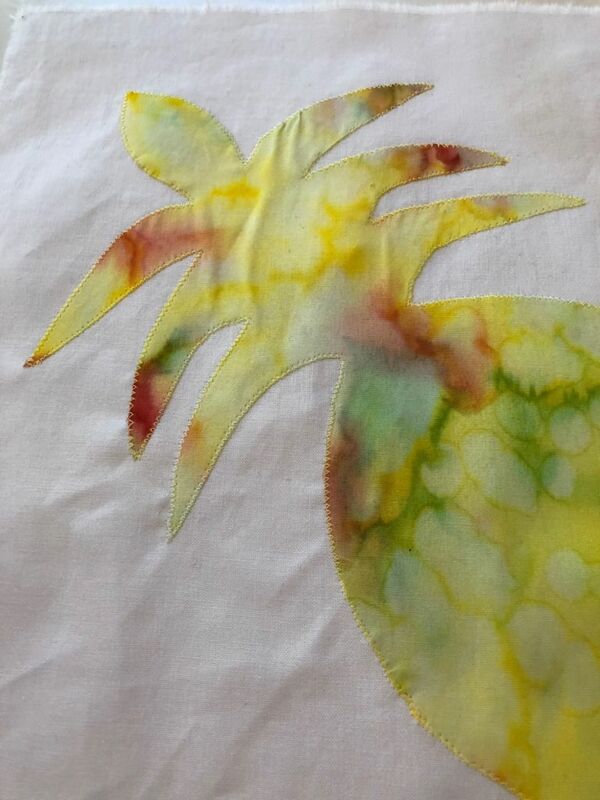 I traced the Hawaiian-themed applique shape to the paper side of the fusible web, cut it out loosely around the traced edges, and fused it to my expensive, beautiful piece of batik fabric. Then I carefully cut out the pineapple shapes on the drawn lines with precision scissors. I immediately noticed the fusible web was pulling away from the fabric. Yes, I had pre-washed the fabric. No, I didn’t use steam in my iron when I applied the fusible web to the fabric. I followed the application directions for this product to the letter. I tried using my iron to “re-fuse” the portions which were pulling away. The product stuck to my iron’s non-stick sole plate more than it stuck to the fabric. Grrrrrr. Still, I persisted. 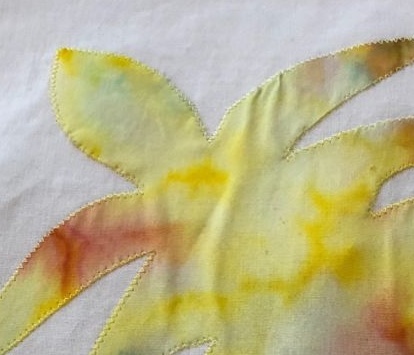 I got the entire shape cut out and carefully following the instructions for this particular product, proceeded to fuse the applique shape to my pre-washed and starched, background fabric. I carefully stitched around the applique edges and my sewing machine sewed like a champ, doing everything it is supposed to do. But the results? Terrible. Sloppy. Sub-par. And all because of the poor quality, name-brand, fusible web. My first attempt using the name-brand, sub-par fusible web. 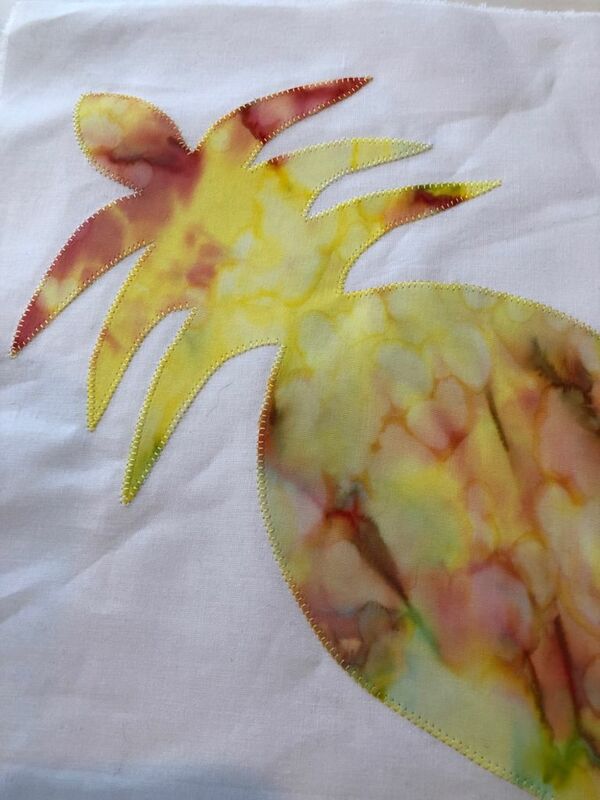 Look at the wrinkles on the applique shape and the puckers at the edges of the stitching! 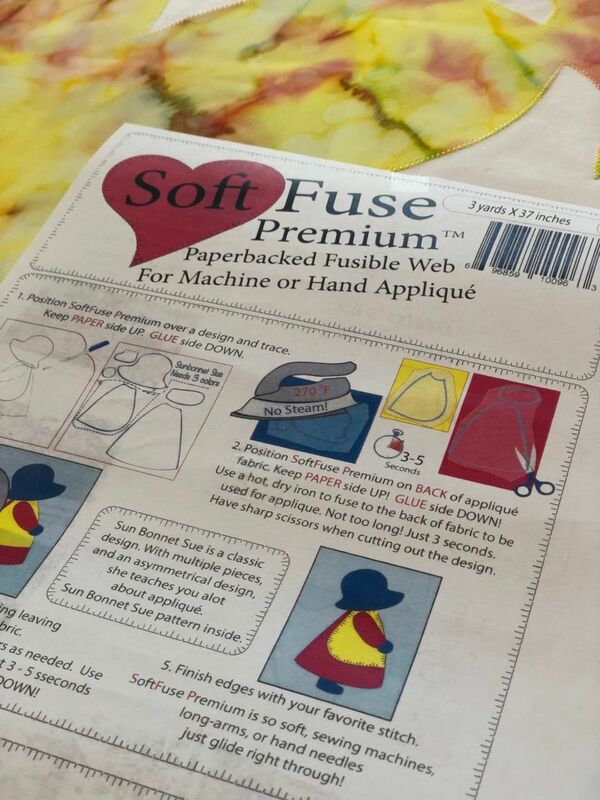 So while I was teaching at Road2CA this past week, I bought two large rolls of my favorite, tried-and-true fusible web, Soft Fuse in the vendor hall. This is the block constructed with Soft Fuse. Everything lays flat, even, and perfectly stitched! And the applique shape itself isn’t stiff or hard. It is soft and flexible. 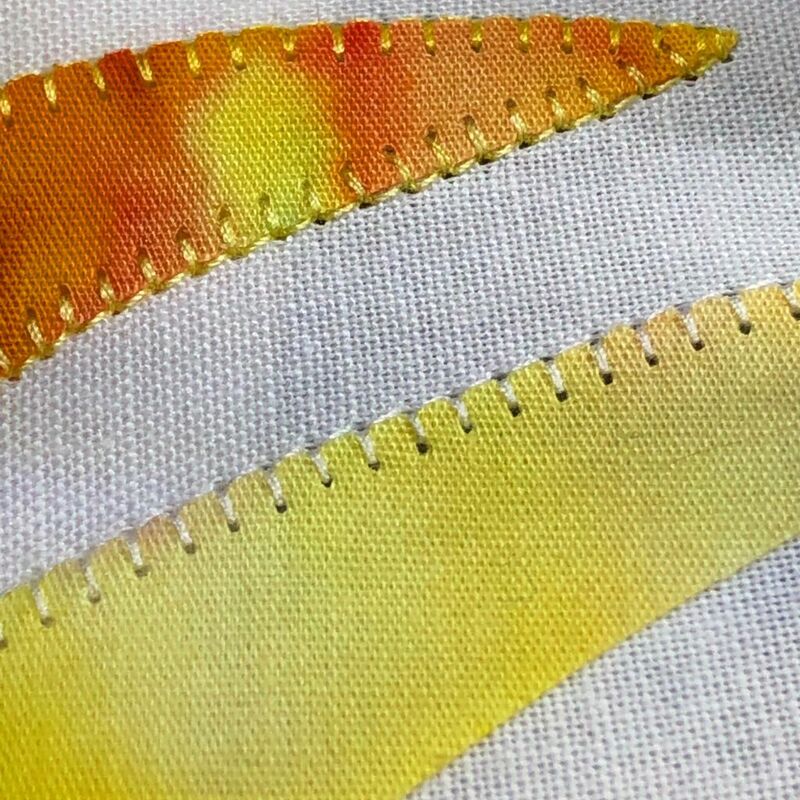 Stitching around the small, pointy edges of the leaves was a breeze and so much fun thanks to my Janome 9450 and a great fusible web! There are no puckers and the stitches are flat and evenly spaced. 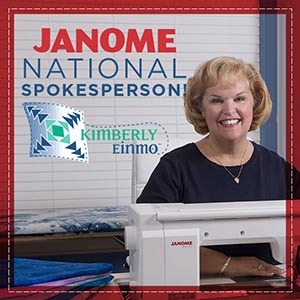 And while you’re here, I invite you to check out today’s Janome life post, which is rather near and dear to my heart. Click here. So the moral of this story? Don’t assume a name-brand product means it is made of high-quality materials. 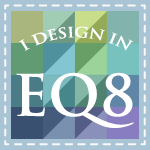 Test any new-to-you product on sample fabrics prior to putting them into your blocks and quilts. You’ll be glad you did. NOTE: I choose not to discuss the name of the actual product because I will not shame or slander anyone publicly. Ever. You simply should test the different products available and make choices based on your own personal experiences. I have recommended Soft Fuse here because it works for me and I am able to achieve great results when I use it. What a shame. You know how a quality product works but what if a newbie started with this. Please tell the company as they need to know. Thanks for sharing your favorite. Mary, you know….feedback to that company is a good idea! I can certainly write to them to let them know of the difficulty I had. I probably won’t hear anything, but at least if anyone at the company is reading comments, they may want to address the poor quality issue. Kim, I loved this post. Informative and with the style and class I always read from your posts… glad the second piece came out the way you wanted. Thank you so much, Sally! Much appreciated. My LQS recently directed me to soft fuse. I have converted. So glad to know you are a convert! LOVE Soft Fuse…..
Kimberly, Thank you for taking the time to let us know about this issue. It was very well written and very diplomatic – also very easy to understand. The “problem” piece looks just like all the appliques I have ever done, using what I thought was a name brand fusible web, and assuming I was the problem. That is the reason I NEVER applique anymore! 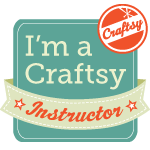 Believe me – I am going to try the brand you recommend and give applique (and my own self doubts) another try!!! Thank you SEW much!!! Maybe the problem isn’t me at all!!! Nancy – Your comment thrills me no end! I’m SO glad you’ll give machine applique another shot. Most likely it WASN’T your fault you weren’t getting good results. Once you can see how easy it is to get good results using the right products, you’ll find joy in including a whole new plethora of blocks and design options available to you again!!! I hope you’ll let me know how it goes once you try it. You’re my “test case.” Most importantly, have fun in the process!